Universal HD is an American digital cable and satellite television network that is owned by the Universal Television Networks unit of the NBCUniversal Television Group subsidiary of NBCUniversal. The network ? which exclusively broadcasts in 1080i high definition ? features a mix of films, drama series, sports, specials and performance arts programming from the NBCUniversal library, most of which are sourced from the company´s cable networks. The channel originally launched on July 31, 2003 as Bravo HD+, serving as a high definition companion service to Bravo, although it did not operate as a simulcast of the network. 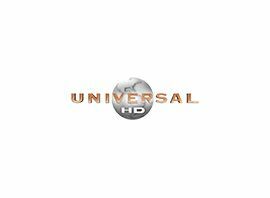 On December 1, 2004, the network rebranded as Universal HD, shifting its focus towards library content from the NBCUniversal television networks. In August 2007, the network began carrying a Wednesday night block of programs from the Sundance Channel; in addition, in 2007, Universal HD broadcast an HD telecast of the Sundance Channel´s presentation of the Live Earth concert, which featured no commentary or hosts. In early 2008, Universal HD unveiled a new logo and a newly redesigned website. In 2008, Universal HD expanded its series content and aired burn-off episode premieres of some canceled series originally broadcast by its sister networks. On February 9 and 10, 2008, the network broadcast a marathon of the entire first season of the CBS drama Jericho. In early 2009, the network began airing same-week encores of the WWE wrestling programs WWE Raw (which airs on USA Network) and ECW (which aired on Syfy) on Saturday nights. ECW was replaced by NXT after the former was canceled in February 2010; NXT moved to WWE.com in October 2010 to accommodate the move of SmackDown (which is now also carried by Universal HD) to Syfy. Much of the programs broadcast by Universal HD were originally aired by one of NBCUniversal´s television networks including NBC, Bravo, USA Network, Syfy, Cloo, Chiller and Oxygen. Movies airing on the network are usually "television" cuts meant for basic cable, which feature content edits, dubbing of profanities and some time edits by removing superfluous plotting or toning down scenes with adult content inappropriate for basic cable broadcast to fit within a set timeslot with commercials added. Films are presented with commercial interruptions, and are broadcast in the 16:9 aspect ratio ? theatrical releases originally filmed at an aspect ratio of 2.35:1 or 2.40:1 are presented in a pan and scan format to fit high-definition television sets and to eliminate screen burn-in on plasma displays. The network regularly airs horror movies under the banner "Chiller on Universal HD," often featuring titles from its sister network Chiller. Universal HD also airs high definition broadcasts of sporting events from various NBCUniversal networks; in 2006 and 2007, it provided a simulcast of USA Network´s coverage of the U.S. Open tennis tournament, along with that network´s coverage of the first and second rounds of The Masters and the Westminster Kennel Club Dog Show in 2007. In November 2007, Universal HD became the exclusive U.S. television broadcaster of the Volleyball World Cup. In 2008, Universal HD aired U.S. Olympic Trial events during or soon after their original airing on MSNBC and USA Network. In addition to airing coverage simulcasts of those same games from USA, MSNBC and CNBC, the network was used to broadcast additional events from the Summer and Winter Olympic Games as part of the company´s wide-ranging deal to carry the Olympics on its various cable channels ? during the 2006 Winter Olympics, these broadcasts were mostly limited to men´s and women´s hockey qualifying rounds and semifinals; during the 2008 Summer Olympics, Universal HD ran simulcasts of MSNBC, CNBC and USA Network´s event coverage. In November 2015 Universal Sports Network ceased operations. NBCUniversal acquired the rights to the content that was previously held by Universal Sports Network. Much of the programming moved to Universal HD, with the rest of the programming moving to NBCSN and NBC Sports Live Extra.